5. How big is Bolivia? Over the years Bolivia has gained and lost a lot of land. 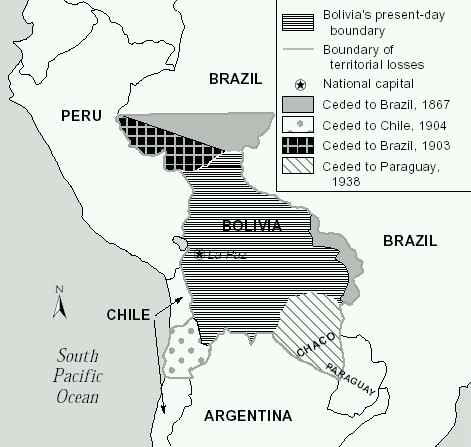 Here is a map of Bolivia's territory throughout the years. Today, Bolivia has a surface area of 1,098,580 square miles. (Image Source). 4. What is Bolivia's climate like? When talking about Bolivia's weather all you need to know is this. Bottom line, we have the rainy season and the dry season, because usually the region plops you into it without any gradual entry and exit. I don't mean exactly that you could be walking in the cold rain and suddenly it will be scorching hot but the weather usually changes quickly. One thing you should know is that the Northern hemisphere and Southern hemisphere climates are reversed, with the Southern hemisphere having it's summer November through February and winter is May through July! 3. What does Bolivia look like? Much of Bolivia is covered by the Amazonian rainforest plains which is home to most of it's wildlife. As a matter of fact I've already talked about some of them here on my blog. However, in Western Bolivia about 25% of the country is covered in mountains and much of Southern Bolivia is dry and arid. 2. What language does Bolivia speak? Bolivia primarily speaks Spanish but several of the indigenous cultures in it speak their own languages. In fact, since 2009 over 30 native languages were all declared official languages of Bolivia. 1. What type of animals live in Bolivia? Bolivia is home to many animals including flamingos, ant eaters, capibaras, jaguars, pumas, llamas, spectacled bears, thousands of birds and millions of insects and all kinds of fish species and other animals. Some of these are even indigenous only to Bolivia! Bonus question. Is there pizza in Bolivia? So I hope you liked today's blog about Bolivia and maybe learned something, too. What questions do you have for us? I'd love to hear them! Until next time, bye!